These goats live in a small region in southwestern Morocco where the Argan tree grows. Although the region is semi-arid desert and there’s fodder elsewhere, they love argan berries. They’re goat candy. 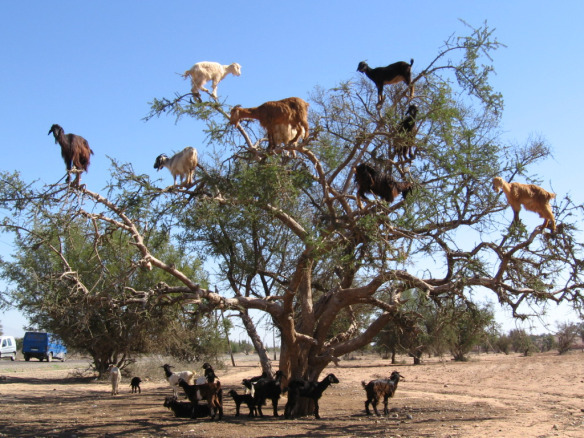 Since the goats can’t reach them from the ground, they learned to climb Argan trees. When the goats poop, local women pick out the hard undigested nuts, crack them, extract the seeds, mash and grind them up, and produce argan oil – all by hand. It gets stranger: only women are allowed to do it. Women […] run the entire industry, which is an incredible fact considering that Morocco is a rather patriarchal society. Only women are taught to make argan oil, and they are the sole gatekeepers to the centuries-old method. Much of the country’s oil is made in cooperatives that allow women the opportunity to work and make money independently [via]. Then they rub it on their faces, put it in their hair or eat it. TRUE. The Berbers were the same people that produced Berber carpets, and had a hand in producing purple dye from seashells – the color of Roman Royalty. It’s also interesting to note that a large percentage of Berbers were Jews, Christians and Animists before those sects were marginalized by Islam in the 7th Century. The Barbary pirates were Islamic Berbers, thrived in the world-wide slave trade, and the word “barbarian” has etymological roots to the Berbers as well. Goats-trees-berries-poop-cosmetics-food-Morocco-Berbers-carpet-purple-Islam-pirates-slavery-barbarians. What a connection, and it all began with Goats In Trees. This entry was posted on Sunday, 10 November 2013 at 12:05 AM and is filed under A Bunk Original, Bizarre, Contributions to the World, Cool, Food, History, Humor, Odd, Potty Humor, True Stories. You can follow any responses to this entry through the RSS 2.0 feed. You can leave a response, or trackback from your own site. James Burke’s Part 3 of Episode 1 of his excellent Connections series is a must see. Be patient until 4:30- that’s where the meat is. LC– I’ll never call you a poopyhead.